"Never miss a thing" was the motto for Tata Bolt when I first saw it in Auto Expo but then it was just a concept car but nevertheless, even then it had left me intrigued. Then came the Zest and I thought no other car from Tata could impress me any further but I am so happy to tell you that I was so wrong! 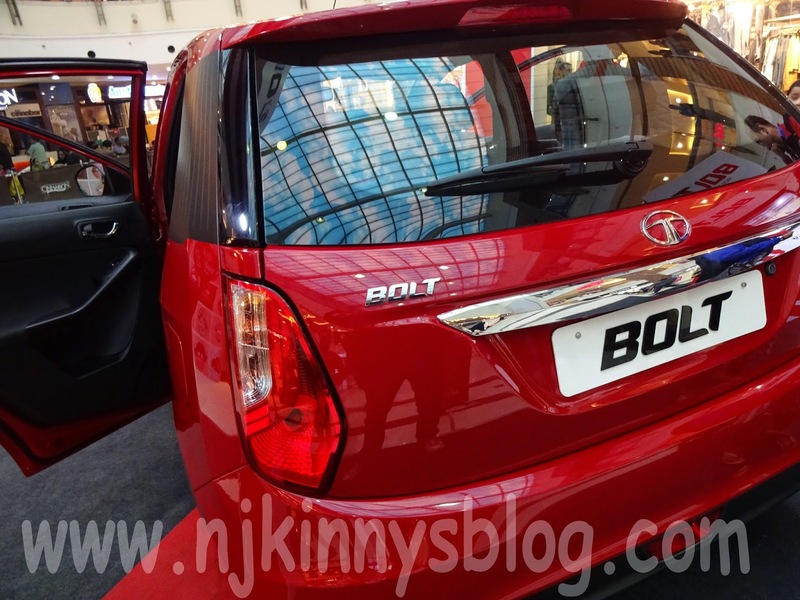 Tata Bolt blew me away with its cool features and its quiet elegance. Tata has wrapped up a very appealing "complete" package with some extra bows and ties in this one. 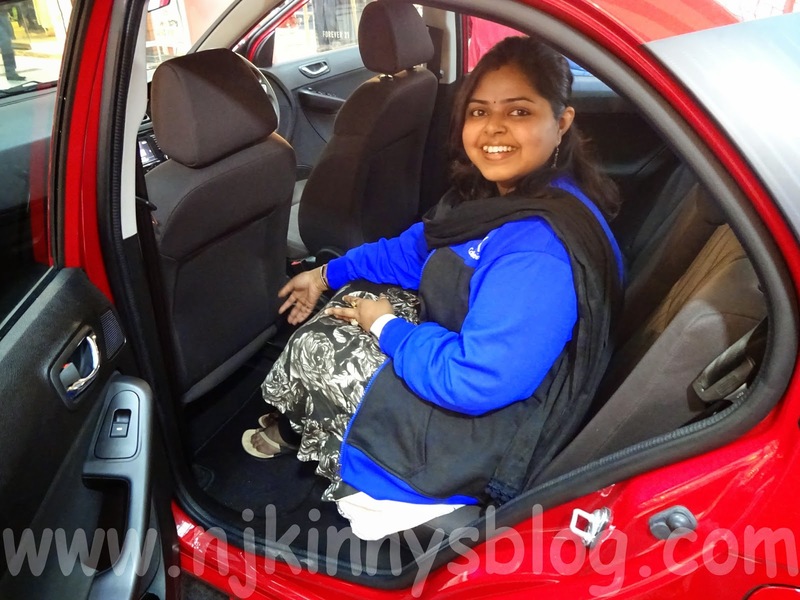 I have been on the lookout for a hatchback from quite sometime simply because they are easy to navigate in the chaotic Indian traffic, park in even the most congested parking spaces and also are more fuel efficient, than the sedans or any other bigger model, which is a feature that every Indian sees when buying a car! So I also needed a hatchback car for the same above reasons and if I could get something extra then that was an added bonus. After many test driving sessions with cars from various companies, I could not seem to find that one hatchback that would make me say, "Yes, this is the one!" Bolt had had me intrigued at the Auto Expo and so this was a great chance to see if it was any good. 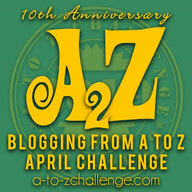 I registered for the contest and was lucky to get selected. Armed with my camera and with my car enthusiast husband by my side, I was ready to explore Bolt from every angle. We reached DLF Place in Delhi and were struck by the elegance and beauty of the car at first sight. If it looks classy in the ad, Bolt looks even more classier in person. 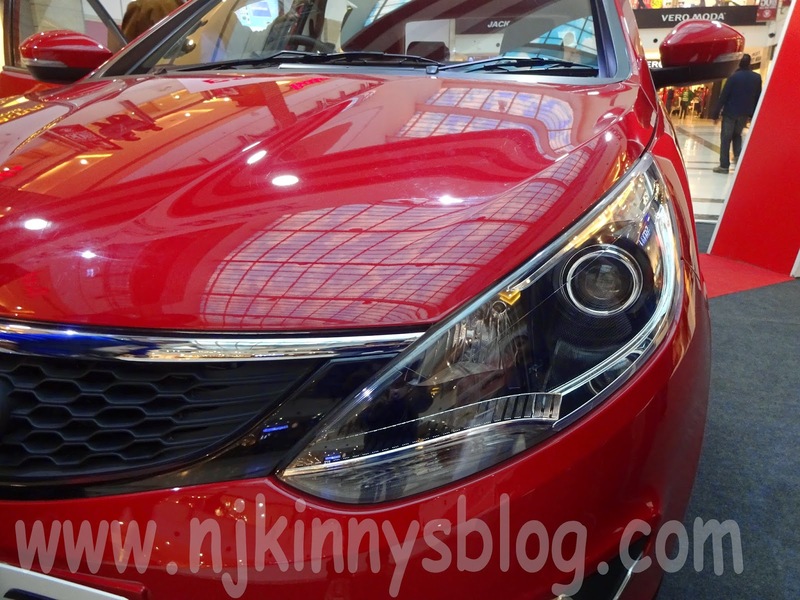 Standing proud in Venetion Red colour, Tata Bolt gives a feel-good vibe right from the start. Elegance redefined by Tata Bolt. I loved it in this Venetion Red colour. We met with the Tata staff present and they were very patient and helpful in answering all our questions. 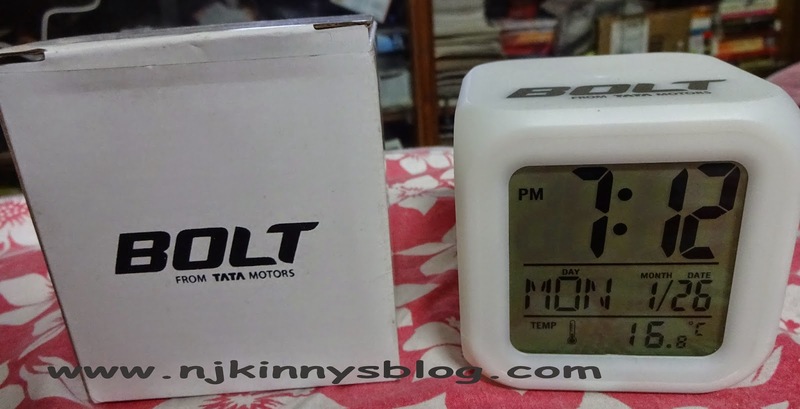 Here are the things that stuck with me about Tata Bolt. 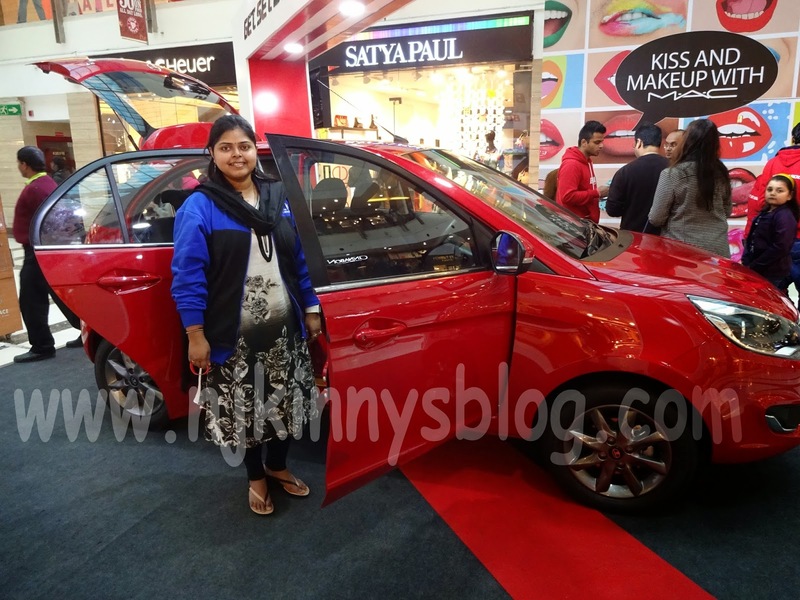 If you think Tata Zest is stylish then you got to check out Tata Bolt. With well designed corners and crisp cuts, Tata Bolt is quite tall with increased ground clearance which is ideal for the Indian roads and is sure to make the ride a smooth one on all the big speed breakers and potholes. The car is also quite long which makes it look quite big for a hatchback. Bolt is quite long and very spacious. Although the grille is same as Zest with black surround, the overall design of the car is new and instantly appeals to our eyes. The black grille adds more charm to the car. First-in-class Projector headlamps have been provided and designed to go with its sporty look. The tail lights are quite unique. They are small and yet every efficient which I got to see during the test drive. Small, unique and very efficient tail lights in the Bolt won my heart! Ample amount of Chrome is used to make the car look more attractive. 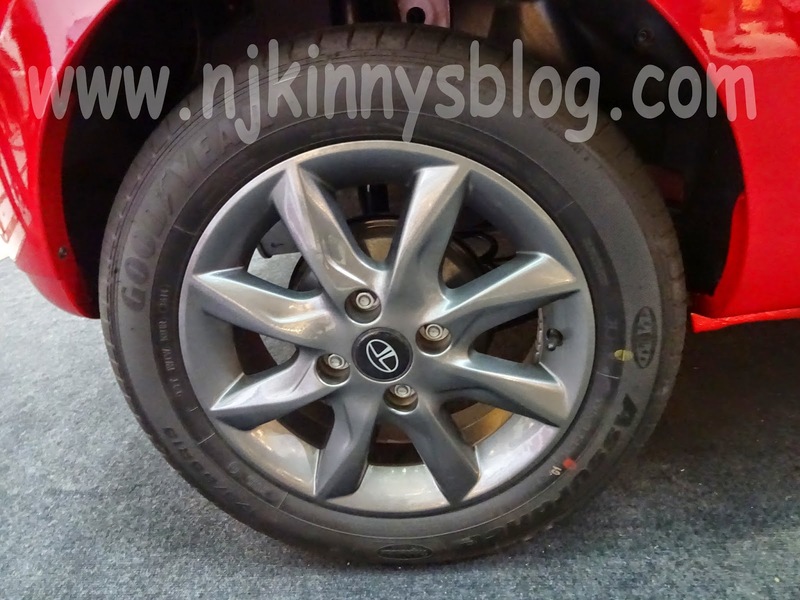 Alloy wheels are being offered in the top model of the car. 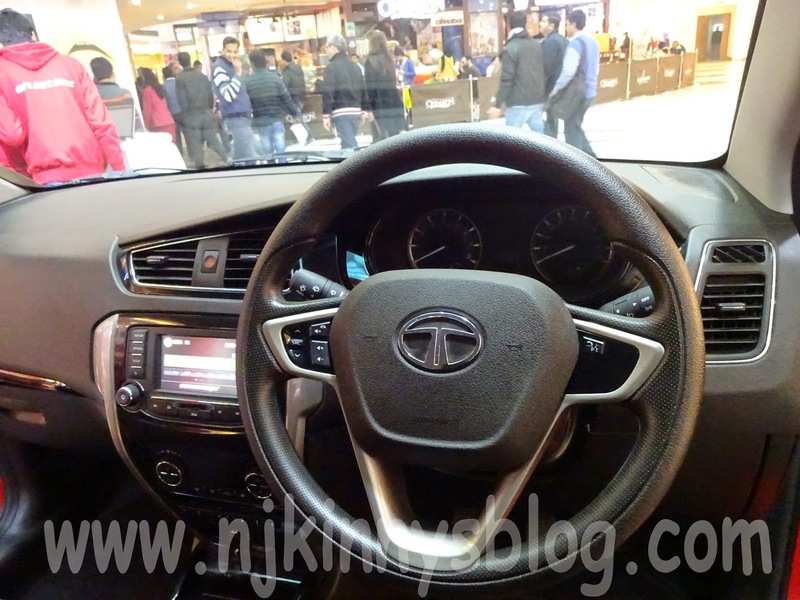 Like the outside, the inside is also all new and nothing looks copied from the other Tata cars. A single black theme is used inside which is elegant and instantly attracted my car enthusiast husband. A black tone gives the car an elegant look. The Steering wheel is smaller than the other cars and has a sporty feel to it. It has a nice grip and is adjustable to accommodate all kinds of drivers whether they be short like me or tall like my husband. There are steering wheel mounted controls for music system and voice command. Smart and sporty steering wheel with mounted controls to assist you while driving. The air vents, automatic air conditioner, touch screen navigation system especially designed by Harman and the music system merge well with the black interior. The all-black interior is well complemented by the indoor savvy gadgets. The boot space is average but enough to store two normal sized suitcases. For the first time ever, a car is offering three modes to enhance our driving pleasure. Tata Bolt comes with Sport, Eco and City modes in the petrol variant of the car. Going alongwith their Auto Expo motto "Never Miss a Thing" now Bolt makes sure that we never miss anything. If you are in a hurry and want to reach a place, switch to SPORT mode and feel the burst of power. If you are low on fuel and don't have a fuel station in your sight, you won't miss it either as you can switch to ECO mode and get the maximum fuel efficiency. City mode is a balance between the Eco and the Sport modes. Loved these swanky smoked projector headlamps. Tata Bolt comes with the REVOTRON 1.2 Turbocharged petrol engine which guarantees a 90 ps max power and max torque of 140Nm is offered from a lower 1,500rpm up to 4,000rpm. The engine is toned down because Zest features the same engine and produces an identical torque starting from 1,750-3,500rpm. But despite this, the engine power and specs are perfect for a hatchback like Bolt and is sure to add more allure to this already attractive car. A definite bonus, this feature of Bolt again differentiates this car from its competitors. it is also equipped to recognize a voice command and also has an array of entertainment options. The stereo offers eight speakers with great audio output and clarity. We can even operate the A.C. apart from the stereo using voice command. Cool, isn't it! I loved the smooth touch screen infotainment which is a heart winner. Tata Bolt takes care of our safety with this generation next safety features with a 9th Gen ABS and two airbags. Both these things are much needed in the current scenario with the increase in road accidents. 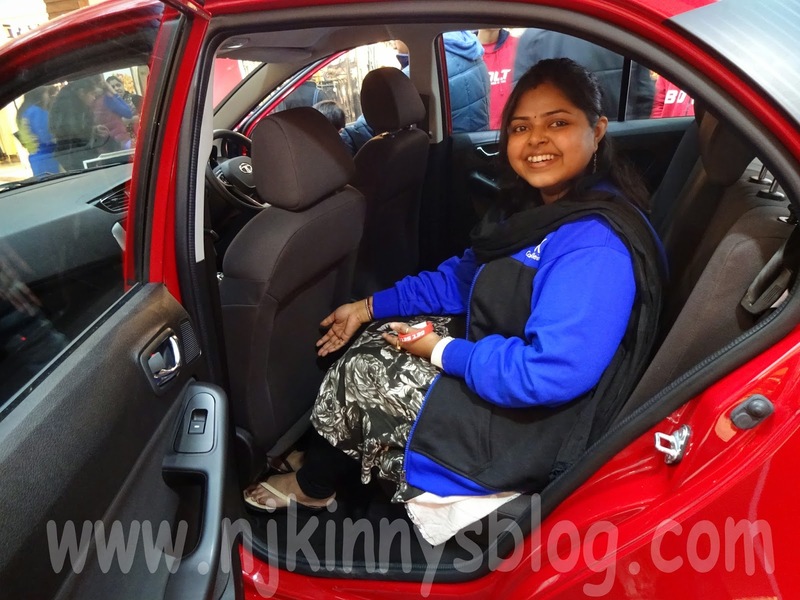 Tata has tackled the issue of space in hatchbacks by providing impressive leg space, shoulder room and head space in this car. The seats are comfortable with adjustable head rests. Spacious and ample leg space at the back. To check the leg space, I tried sitting in the back while my husband who is 6' 3'' sat in the front with the seat pushed back. I am 5' 3'' and I was so happy when I could sit comfortably at the back without any congestion. Bolt has still ample leg space even when the front seat is pushed back. The head space is further a point well taken care of by Tata. My husband who often complains of his head banging the roof of the car on bumps in the road, was pretty happy when he sat comfortably without any disaster all through the bumpy ride. As I talked earlier, the petrol engine is REVOTRON 1.2 turbocharged MPFi engine which guarantees a max power of 90 PS@5000 RPM and torque of 140 MN@1500-4000 RPM. The ARAI claimed fuel efficiency is 17.6 km/l which is quite impressive. The diesel engine is a 1.3 litre Fiat sourced Quadrajet engine that we also see in Zest but this one is toned down to give max power of 70 PS@4000 RPM and torque of 190 NM@1750-3000RPM. Both these features are good for a hatchback car. The ARAI claimed fuel efficiency is 23 km/l which is impressive. Tata Bolt is stands apart with its high ground clearance which effectively glides over the bumps in the road. The suspension is better tuned to soak the impact of the bumps and potholes in the road. I was also impressed with the soft clutch which is rare in diesel cars. Performance of the newly added Distinctive Features like the navigation system etc. 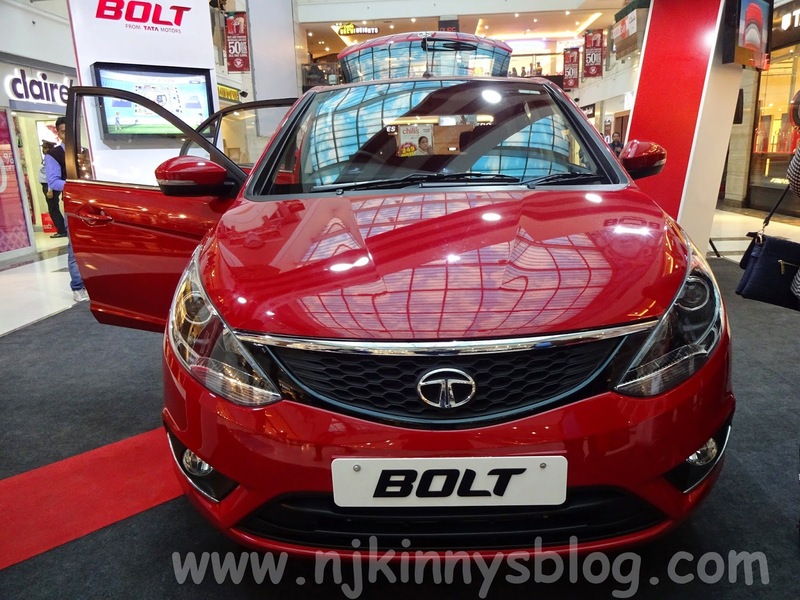 Should people buy Tata Bolt? A surprise gift from Tata. Thank you! Can you see the smile on my husband's face? 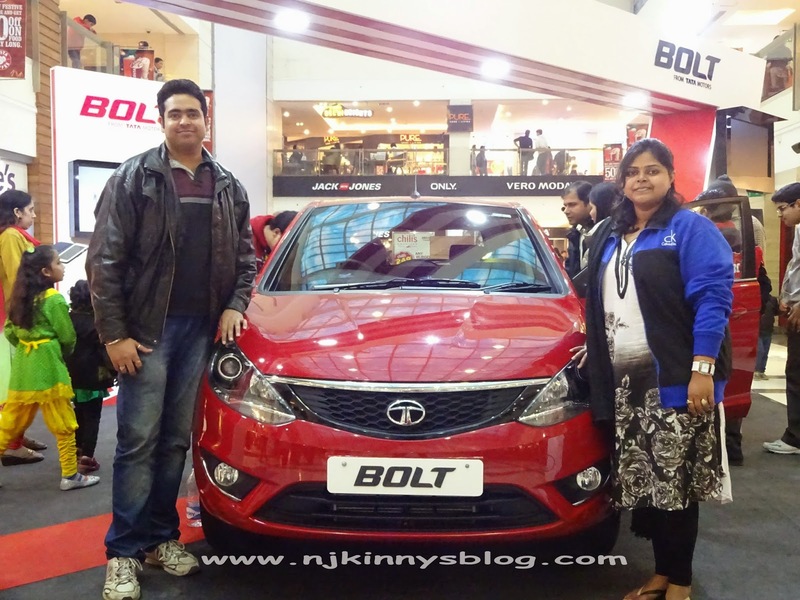 He was a happy man after his introduction with Tata Bolt! 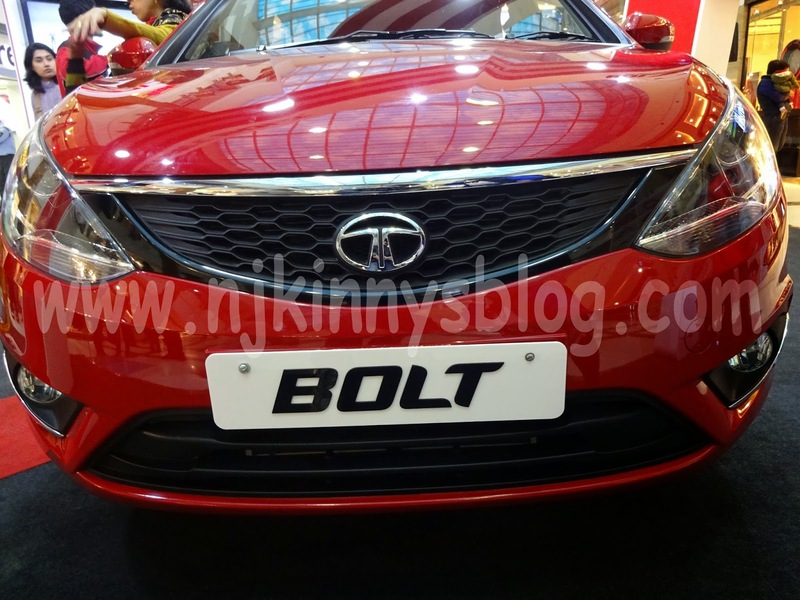 Tata Bolt is "the" new car in the block and poses serious competition to the other cars in its class like Maruti Swift, Datsun Go etc. Price starting at 4.45 lacs and with features as appealing as above, Bolt is a car that you should go test drive if you are planning on buying a mid-sized hatchback. This post is a part of the Get. Set. Bolt. activity at BlogAdda. All the opinions are my own and in no way influenced.